Handmade Detroit | Under the Handmade Detroit tent at DIY Street Fair this weekend! Under the Handmade Detroit tent at DIY Street Fair this weekend! Woo hoo! We are taking part in two big events this weekend. 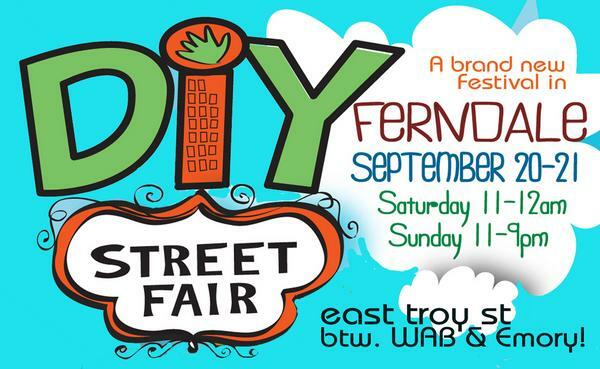 First up is the DIY Street Fair in Ferndale, which our own Carey has helped organize! The fair takes place from 11 .m. to midnight Saturday and 11 a.m. to 9 p.m. Sunday in the southeast corner of Woodward and Nine Mile roads. “This free 2-day event invites artists, hand-made crafters, local and national businesses, non-profit groups and organizations, musicians, local restaurants, michigan brewers and others who live and work with a DIY (that’s, “do it yourself”) ethic. and of course, our Handmade Detroit T-shirts, mitten pins and magnets to raise money for the upcoming Detroit Urban Craft Fair. Tons more info on the DIY Street Fair site. See you there! Pingback: Handmade Detroit » Under the Handmade Detroit tent at People’s Art Festival!